There are two different kinds of piezo tranducers. What we consider the "normal"piezo speaker is a small (often horn loaded) cone driven by a piezocrystal. The crystal bends when a current is applied. Another kind of piezo-transducer is the PVDF film, which contracts and expands. This principle is only unsed by Audax and Gallo. THUNDER™ device which vibrates the flat panel. that is used as the adhesive to make the NASDRIV™ devices. PAR Technologies, Inc is the only company in the world licensed to manufacture and sell this film. It is a high performance polyimide with superior properties to other polyimide films. The major difference is that this film is a superb hot melt adhesive and remains flexible from cryogenic temperature to 300 degrees Centigrade. It is this film that is the secret to making the NASDRIV™ devices. pre-stresses the piezo to give it a curved shape and therefore, higher displacement when actuated. The NASDRIV™ piezo device will generate frequencies from 50Hz to 15KHz. A polymer that listens and talks! A polymer made of 1,1-difluorethene, polyvinyleden difluoride (PVDF) is what you call piezoelectric. In other words, - it will produce an electrical current when bend or pressed. You can make a long ribbon or bend it in almost any shape. It will then act as a microphone or a speaker. Disadvantages: The polymer film is quite expensive - approx 12 US dollar for a small 4" by 4" square. Soldering lead wires to the film is very difficult as the surface "moves" on the microscopic level. Soldering with very high silver contence has been usede with great succes. The frequency range is limited to the upper range - depending on the size the lower limit is typicalle around 3-5 kHz. polymer film, coated on both sides with a vacuum deposit of pure gold, for the diaphragm. This polarized film is clamped to an elliptical ring with a sealed and pressurized chamber behind it. A dome is formed by the constant, positive force from the pressurized gas on the film. frequency can be customized by adjustment of the component values. The HD-3P was developed for use in 2 and 3 way systems, with a -6 dB/octave crossover at or above 6 kHz. System sensitivity should be inthe range of 86 dB to 94 dB. The impedance of the HD-3P is 4 Ohms. Duo is the latest speaker from Anthony Gallo featuring the patented CDT™ tweeter, placed between two 4" Mid- woofers. 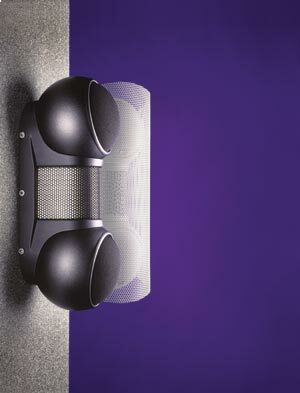 Gallo claims "the most natural and extended trebles of any speaker on the market". Sensitivity is stated to be 93dB and bandwith going to 40kHz along with textbook- perfect dispersion. Anthony Gallo calls his tweeter "A tweeter without compromise". His proprietary design is called CDT, or Cylindrical Diaphragm Transducer. Gallo spent eight years refining this creation. As the Gallo marketing literature points out: "The CDT uses no voice coil or magnets. Instead, the signal is passed across the conductive surface of the diaphragm, which attempts to expand, while the cylindrical shape of the driver supplies the necessary restorative force." The diaphragm is made from an aerospace plastic called Kynar®, coated in silver. Only high purity oxygen-free copper is used for the wire leads, soldered to each end with silver. The tweeter is surrounded by a custom made aluminum enclosure - it is most effective in providing protection. The Gallo literature also boasts that the tweeter is impervious to electrical or mechanical damage.